Now that these hot conditions will be coming to an end tonight, our next area of focus will be on the threat for some strong thunderstorms Sunday afternoon and evening. We are under a Slight Risk for Severe Weather. A cold front will be moving into the area tomorrow afternoon, initiating thunderstorm development across the Stateline area. As for this evening, heat indices will be in the triple-digits early on, but then in the low 90's by late evening, with temperatures becoming more manageable in the mid 70's overnight. 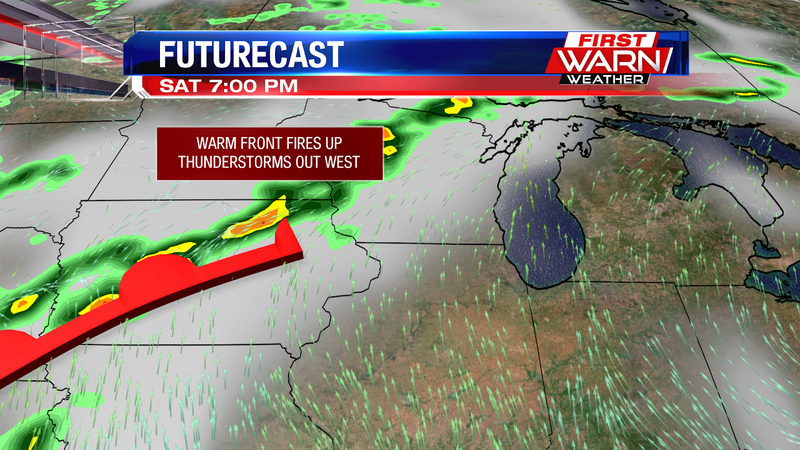 This warm front to the west will continue firing up thunderstorms going through the evening over in Iowa. This front will slowly drift southward during the evening, which will allow these thunderstorms to drift towards us as we head into the overnight. 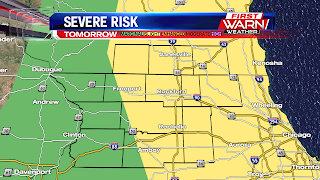 Jo Daviess, Carroll, and Whiteside counties have the best chances for seeing thunderstorms after 10pm as we head into the overnight. 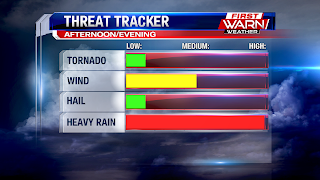 These storms aren't expected to be severe, but some quick bursts of heavy rainfall will be possible. By the time we get to around 4am, a shortwave trough will dig into our area, bringing us chance for seeing isolated thunderstorms that push further eastward into the viewing area. The orange area is the area that has the best chances for seeing thunderstorm activity during the overnight, while the far eastern areas will mostly likely stay dry. 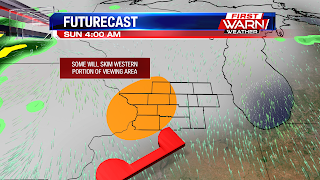 Once we get to early Sunday morning, a few thunderstorms may linger in Jo Daviess, Carroll, and Whiteside counties, but otherwise the Stateline will be dry for Sunday morning. However, once we get into the afternoon our thunderstorm chances will return. We stay dry early afternoon, but after 1pm our thunderstorm chances will start going up with an approaching cold front from the west. This will bring isolated thunderstorms late afternoon, with scattered thunderstorms moving in as we head into the evening. The main threat that will come with these thunderstorms is flooding, as some heavy downpours will be possible in some of these thunderstorms. A few strong wind gusts and quarter-sized hail will also be possible in these storms due to high instability, but flooding is the main concern as we are still recovering from the recent floods. Heading into the work week we look to stay dry, but it'll stay pretty warm and muggy through most of next week, as temperatures look to be in the upper 80's. A quick pop-up storm will be possible for Fourth of July, but otherwise we look to stay dry for the holiday. 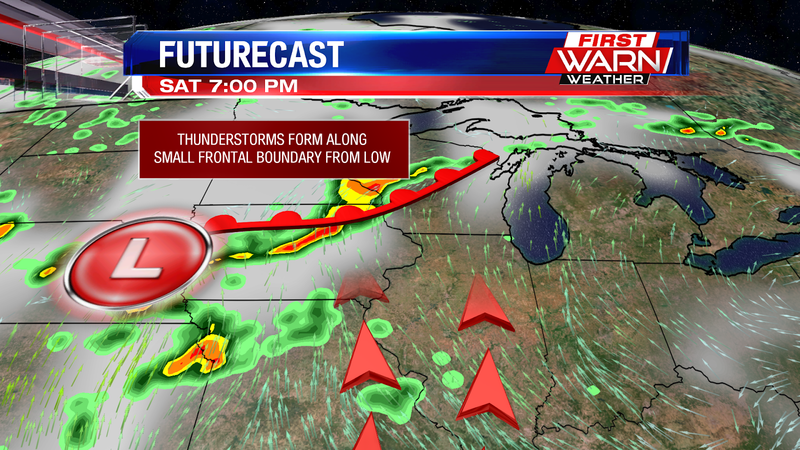 Better thunderstorm chances come in on Thursday with a weak frontal boundary moving through. Temperatures could reach the 90's again for Fourth of July and Thursday. Hopefully most of you weren't fooled by the sunny, nice-looking skies today, because once you stepped outside it was a whole other story! Heat Indices got into the mid 100's this afternoon, and we're possibly looking at slightly hotter conditions for Saturday. 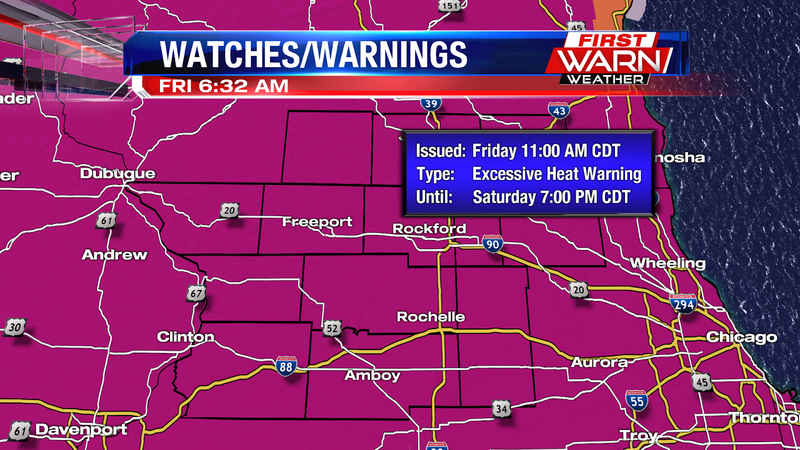 The Excessive Heat Warning has expanded for all of the Stateline until Saturday at 7:00pm because of this. As we go through Friday evening the triple-digit heat indices will die down, but it'll still be hot and muggy with heat indices in the low 90's during the evening. Not until the overnight will we start to see more manageable temperatures in the mid 70's, with some patchy fog forming after 2am. 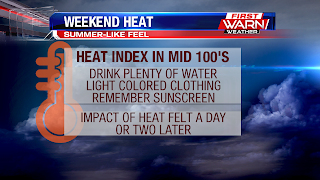 With the excessive heat to start the weekend not only do you want to look out for yourself, but also for your kids and pets! 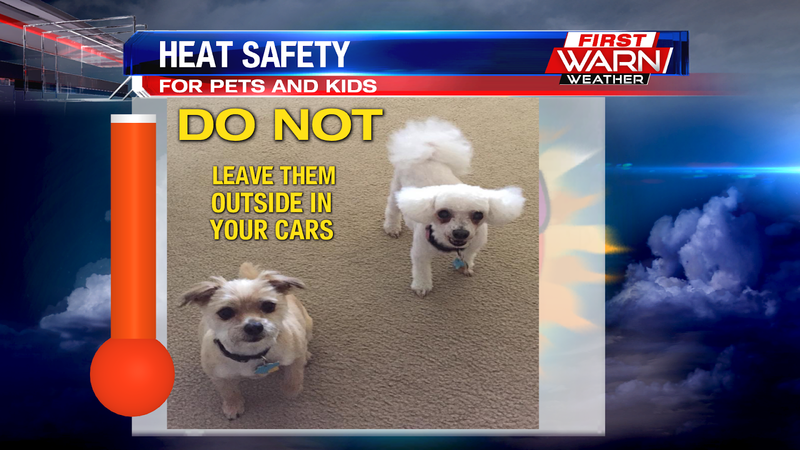 They both are very sensitive to heat, especially dogs with their paws being sensitive to hot concrete and basically wearing a fur coat. 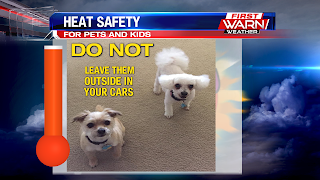 And above all else, DO NOT LEAVE THEM IN CARS!!! 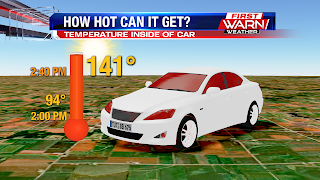 When it's a sunny day with temperatures at 94°, the interior of your car can heat up to 140° in just 40 minutes! That's 1.5x the outdoor temperature. Just imagine if you were to leave your car outside for a longer period of time in these conditions. Definitely something to consider during this heat wave. 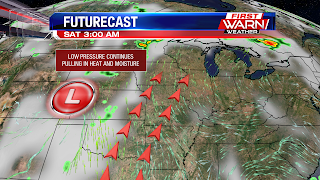 This low pressure system will continue pulling in heat and moisture into our area through Saturday evening, keeping the hot weather lingering in our area. Once we get into Saturday evening, that low pressure system will track northeast, forming a small warm front just northwest of the Stateline. This will form some thunderstorms, some of which may skim the far western portion of the viewing area during the overnight Saturday night. 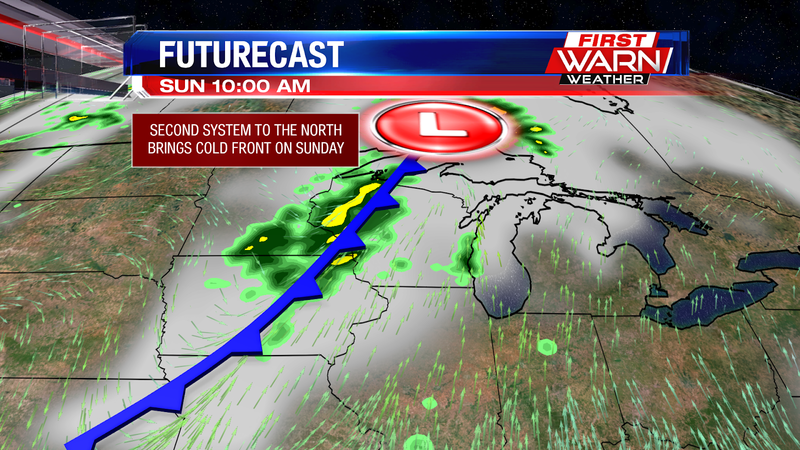 Relief finally comes in the form of a cold front on Sunday. However, this will allow for thunderstorms Sunday afternoon, some of which could be on the strong side as it'll still be fairly warm alongside having that frontal boundary in play. The main threat would be strong wind gusts, with quarter-size hail being possible as well. Once we get into the work week, temperatures will be in the mid 80's most of the time, with temperatures possibly hitting the low 90's on Fourth of July. A couple quick pop-up storms will be possible for the Holiday, but otherwise we should be dry with warm and muggy conditions. We had a nice summer day with sunshine and temperatures hitting the mid 80's this afternoon, but that's nothing compared to what we're going to be seeing as we head into the weekend. 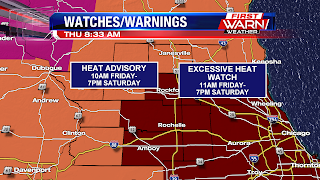 Excessive Heat Warnings have been issued for much of the Stateline, starting Friday at 11am and going through Saturday until 7pm, with some hot weather lingering into Sunday as well. 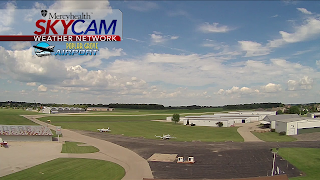 As for this evening, a quick passing shower will be possible for Carroll and Whiteside counties, but otherwise we stay dry for the evening with mostly cloudy skies and temperatures in the low 80's. We cool to the mid 70's overnight, with isolated storm chances increasing as we get closer to 7am Friday morning, when a warm front moves into our area. After 10am the front moves out, and then we stay dry heading through Friday afternoon with partly cloudy skies and temperatures hitting the mid 90's. 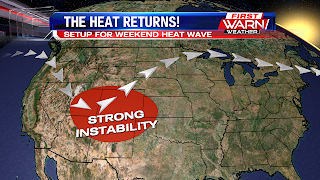 The setup for this next heat wave includes an upper-level trough to the west, which will build instability at the surface and allow for a low pressure system to develop in that area. 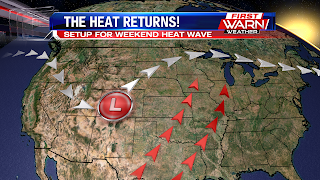 That low will then track northeast along the jet, continuously pulling hot, humid air into our area during that time, for both Friday and Saturday. 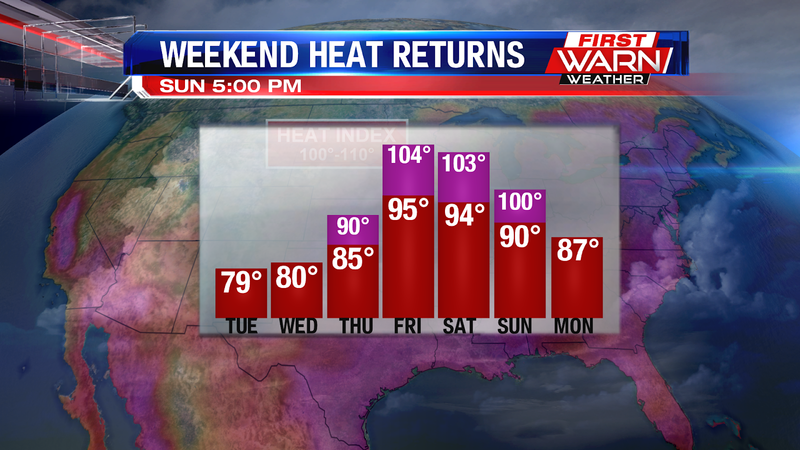 This will bring temperatures into the mid 90's for both days, but Heat Indices will be in the mid 100's for both days. Very hot!! The Dew Point Temperatures are really what will be making it feel much hotter outside. Dew Points are expected to be in the upper 70's for both Friday and Saturday. The high heat and humidity will allow for a couple pop-up thunderstorms for Friday and Saturday afternoon, but mostly we stay dry. Definitely stay safe if heading outside Friday or Saturday. Have water by you at all times, and have easy access to shade or other cool areas as your body can become de-hydrated and over-heated quickly in these conditions. 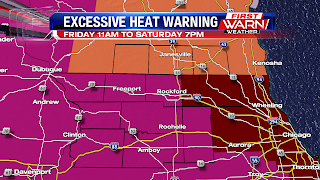 Multiple heat headlines have been issued ahead of the dangerous heat and humidity this weekend. 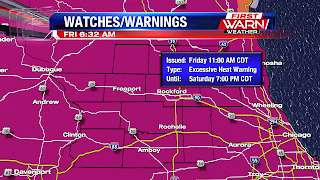 A Heat Advisory goes into effect Friday morning for Stephenson, Jo Daviess, Carroll, Whiteside, Green, Rock, and Walworth counties until Saturday evening. 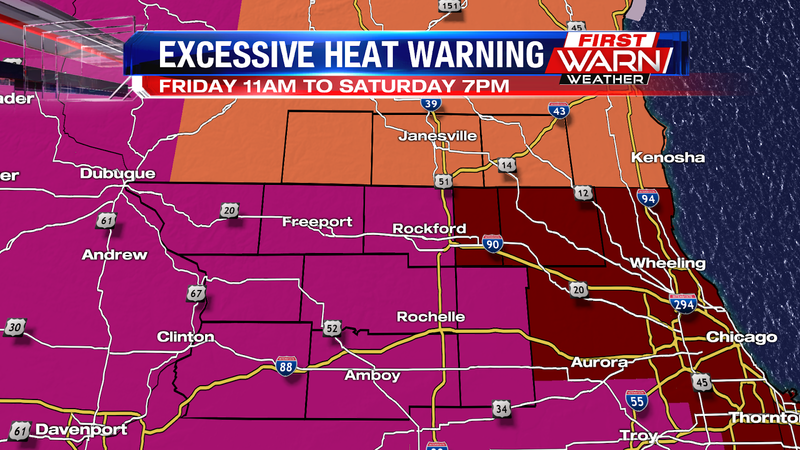 An Excessive Heat watch has been issued for Winnebago, Boone, Ogle, Lee, DeKalb, and McHenry counties from 11am Friday through 7pm Saturday. 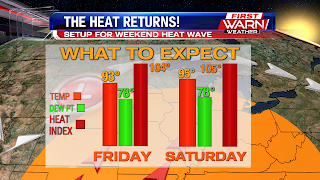 Temperatures will be climbing into the mid 90's for most of the area, but with dew points in the mid 70's peak heat index values will climb between 100°-110° for both Friday and Saturday. Not only that, but overnight lows will remain in the low to mid 70's. With warm nights forecast, it doesn't give our bodies a chance to cool down, which only compounds the impacts of the heat. Remember to stay hydrated and drink lots of water. Take breaks from the heat and get in the air conditioning if you can. Cool showers help, but fans won't help much with highs in the mid 90's. Make sure to keep an eye on your pets too, watch out for hot pavement, make sure to keep them supplied with lots of fresh water and make sure they have plenty of shade. Check on neighbors and the elderly during this time, and try not to expert yourself too much outside. A cold front arrives Sunday with a chance for scattered showers and storms, but highs will remain in the upper 80's. 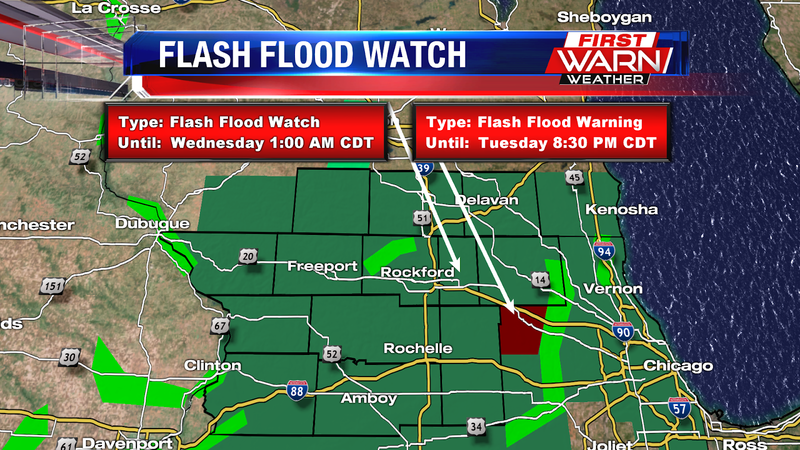 A Flash Flood warning remains in effect for eastern Winnebago County until 9:45 PM. Scattered thunderstorms continue to move over northern Illinois producing heavy rainfall, with rainfall rates up to one inch per hour. 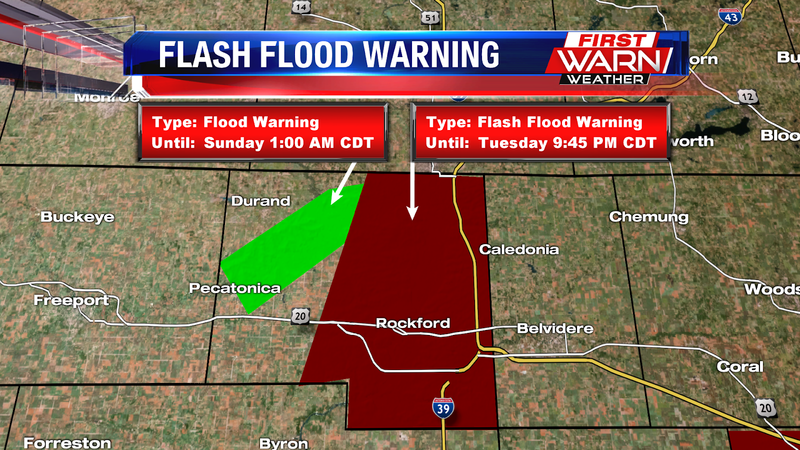 A new Flood Warning has been issued for Boone and McHenry counties until 9:30 PM tonight. Repeated rounds of heavy rain can produce flooding on already saturated ground. (9:52:58 PM) nwsbot: Local Storm Report by NWS DVN: Freeport [Stephenson Co, IL] trained spotter reports HEAVY RAIN of E1.65 INCH at 09:50 PM CDT -- total rainfall since 6 am today. (9:17:20 PM) nwsbot: Local Storm Report by NWS LOT: 1 E Rockford [Winnebago Co, IL] trained spotter reports HEAVY RAIN of M3.00 INCH at 09:16 PM CDT -- standing water in yards and low lying areas 6 inches to a foot in spots. water starting to recede. (7:42:22 PM) nwsbot: Local Storm Report by NWS LOT: 1 W Rockford [Winnebago Co, IL] law enforcement reports FLASH FLOOD at 06:30 PM CDT -- north central avenue was impassable due to flood from rainfall from 530 to 630. (2:43:31 PM) nwsbot: Local Storm Report by NWS LOT: 1 E Rockford [Winnebago Co, IL] trained spotter reports HEAVY RAIN of M1.90 INCH at 02:38 PM CDT -- total today as of report time. 0.9 inches with morning round and 1 inch with afternoon round. 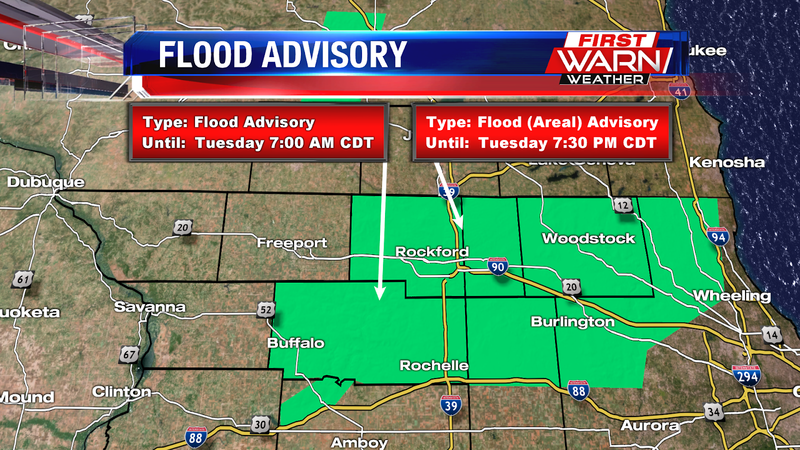 some minor low lying flooding/ponding...including in backyards and on some roads. (3:28:12 PM) nwsbot: Local Storm Report by NWS LOT: 3 ENE Roscoe [Winnebago Co, IL] trained spotter reports HEAVY RAIN of M1.63 INCH at 03:25 PM CDT -- rainfall total so far today is 1.63 inches. 1.5 inches of that fell from 2pm to 3pm. (3:39:19 PM) nwsbot: Local Storm Report by NWS LOT: 1 WSW Rockford [Winnebago Co, IL] broadcast media reports FLOOD at 02:30 PM CDT -- 6 to 10 inches of standing water on charles street and 9th street intersection. relayed via twitter. (4:47:04 PM) nwsbot: Local Storm Report by NWS LOT: 3 W Poplar Grove [Boone Co, IL] emergency mngr reports FLOOD at 04:31 PM CDT -- approximately 6 inches of standing water on route 173 east of wyman school road. same report also relayed by trained spotter via twitter. (4:49:31 PM) nwsbot: Local Storm Report by NWS LOT: N Poplar Grove [Boone Co, IL] emergency mngr reports FLOOD at 04:40 PM CDT -- about 6 inches of standing water on route 173. 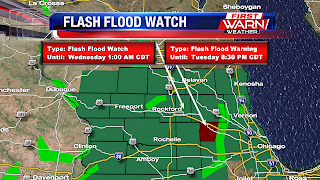 Storms that have passed through earlier Tuesday afternoon produced heavy rainfall, and with additional upcoming thunderstorms, flash flooding is a huge threat in our area. The ground is very saturated so with even more rainfall headed our way, that will cause incoming rain to runoff quickly. 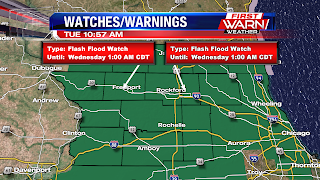 We have a Flash Flood Watch for our area through late tonight/early Wednesday morning. 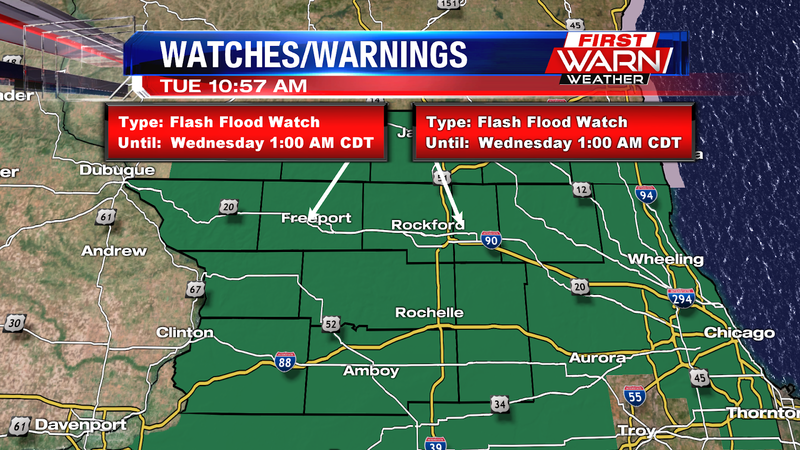 Along with the Flash Flood Watch, there are flood advisories in the northern parts of Illinois due to these rain efficient storms. 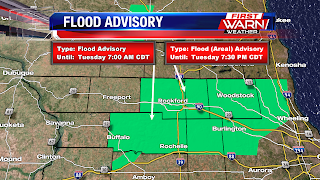 This advisory covers many local areas including Rockford, Woodstock, Wheeling, Burlington, Buffalo, DeKalb, Mount Morris, Buffalo and Rochelle. 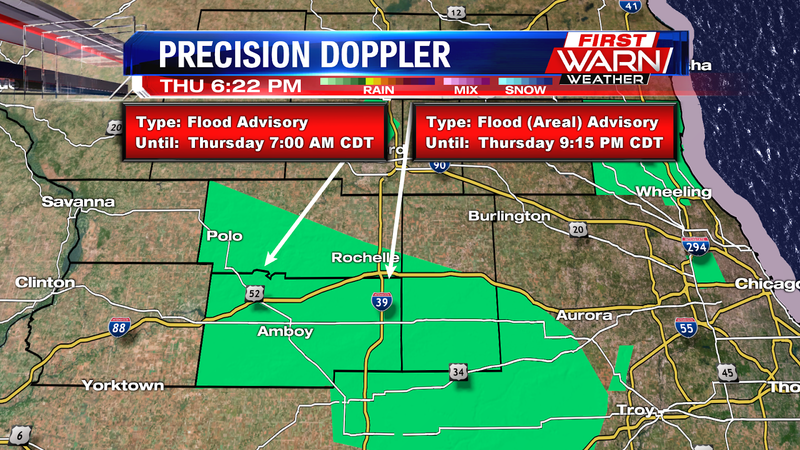 The Flood Advisory is valid until 7:30 PM this evening. Several storms rolled through Tuesday afternoon and mother nature is not done with us yet. We are expecting more showers and thunderstorms as we go into this evening. These are progressive moving storms and they wont stick around for hours unlike the storms from last Monday. There is a push in the atmosphere that is making them move along quickly. Also, because there is a lot of moisture in the atmosphere, these systems will produce heavy downpours. 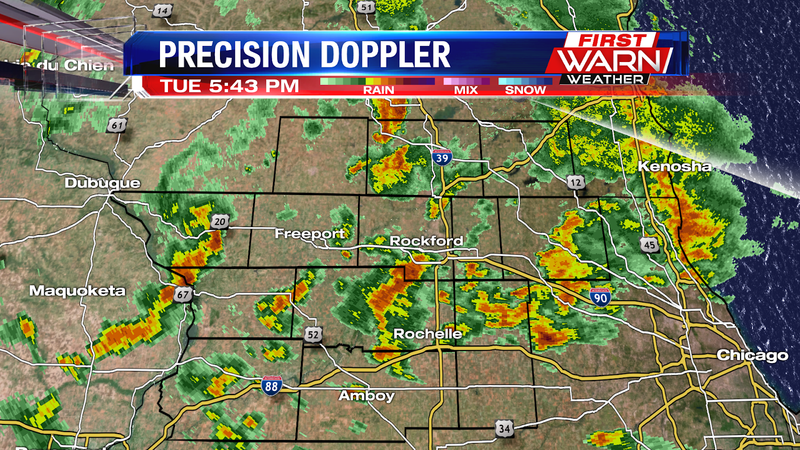 Flooding from these storms will be our main threat for this evening. 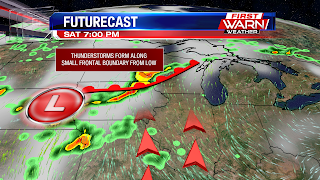 Low pressure system over Iowa this morning, and it's warm front near the Quad Cities, will provide the threat for strong to severe storms possible near it this afternoon. While the ingredients are all there for strong storms, it isn't set in stone. But right now, storms look to develop to our west after the lunch time hour today. However the higher threat for stronger storms will arrive closer to 3/4pm and will last into the early evening. There is a threat for all severe hazards, heavy rain, lightning, strong winds, hail, and even isolated tornadoes possible. 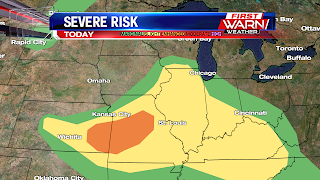 The highest risk for this lies closer to the Quad Cities and areas south near the system's warm front with the storms still in cellular form. As they move east they will come together in a line, and will then bring a higher threat for strong winds and heavy rain. 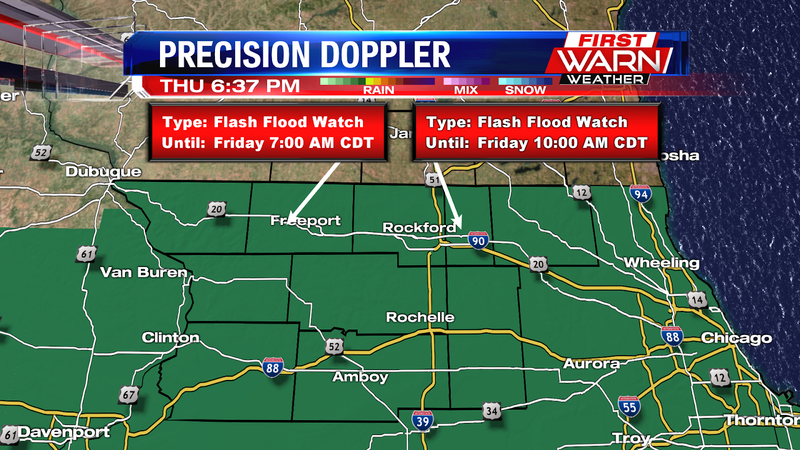 A Flash Flood Watch will go into effect at 1pm and will last through 1am with 0.50" to 1.50" of rain possible across northern Illinois and southern Wisconsin. 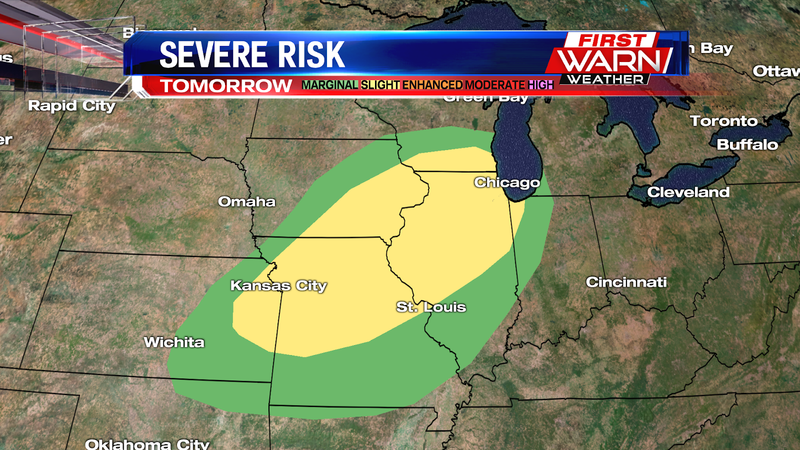 A slight risk from the Storm Prediction Center is in place east of the Mississippi River and extending across the Stateline and most of Illinois. It will be an afternoon and evening to stay weather aware, and make sure to have a way to receive watches and warnings if we get them. Ahead of a warm front, scattered showers and storms have been developing and lifting north and east around 20mph. The severe threat is low this morning, but heavy rain and lightning, along with small hail will be possible. 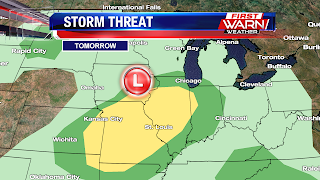 Low pressure moving into western Iowa late Monday night will bring an increasing chance for thunderstorms Tuesday afternoon and evening over central and northern Illinois. A warm front will lift towards northern Illinois Tuesday morning and early afternoon as low pressure moves into eastern Iowa. 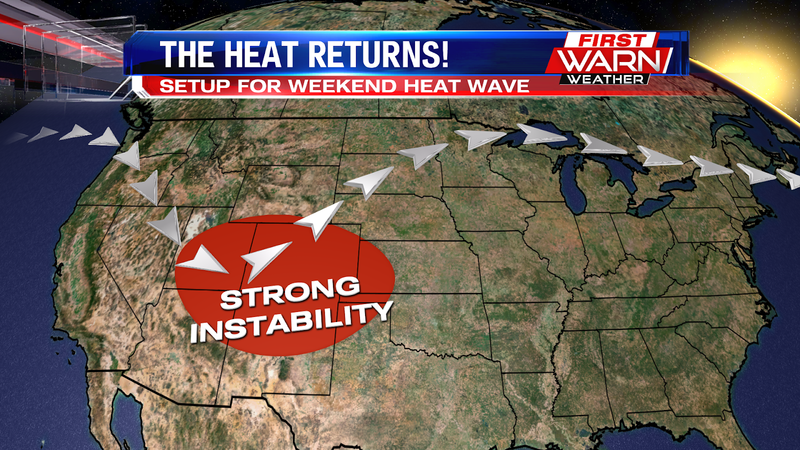 Instability will remain greatest south of the warm front, which now looks to remain just south of the Stateline. 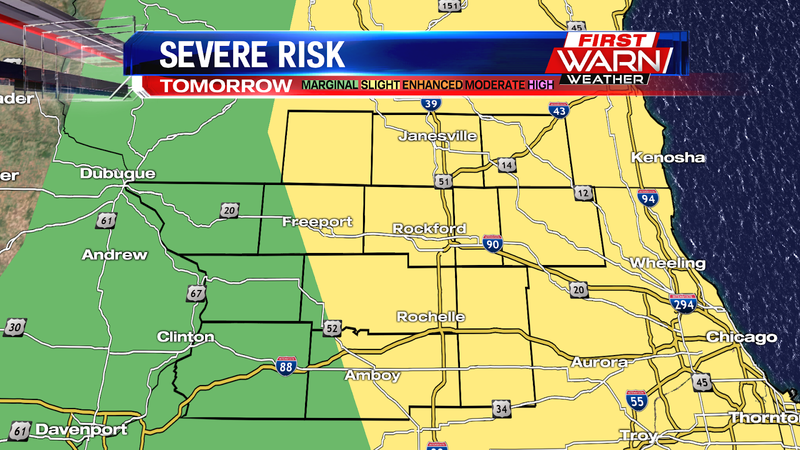 A Marginal Risk for severe thunderstorms is in place over northern Illinois, with a Slight Risk south of I-88. 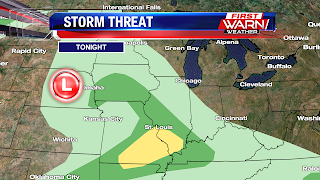 North of the warm front, strong thunderstorms capable of producing hail and heavy rain will be possible. This includes northern Illinois and southern Wisconsin. 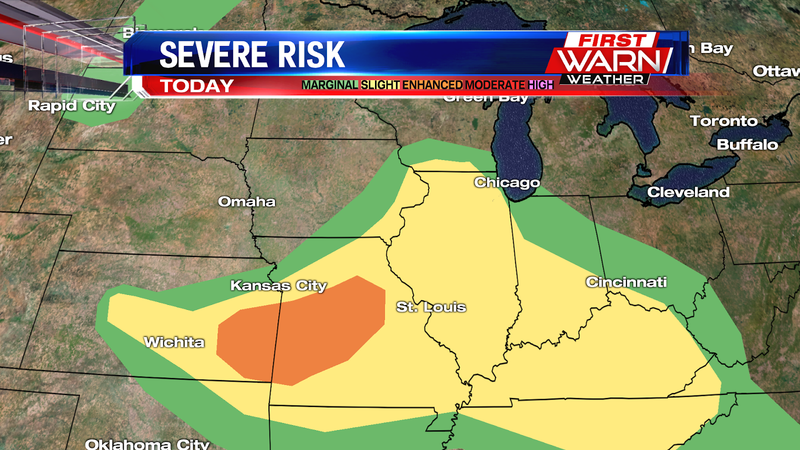 But south of the warm front thunderstorms will be capable of all modes of severe weather, including isolated tornadoes. 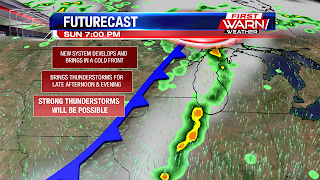 The threat for storms will decrease Tuesday evening with the passage of a cold front. A weak ridge of high moves in Wednesday and Thursday. 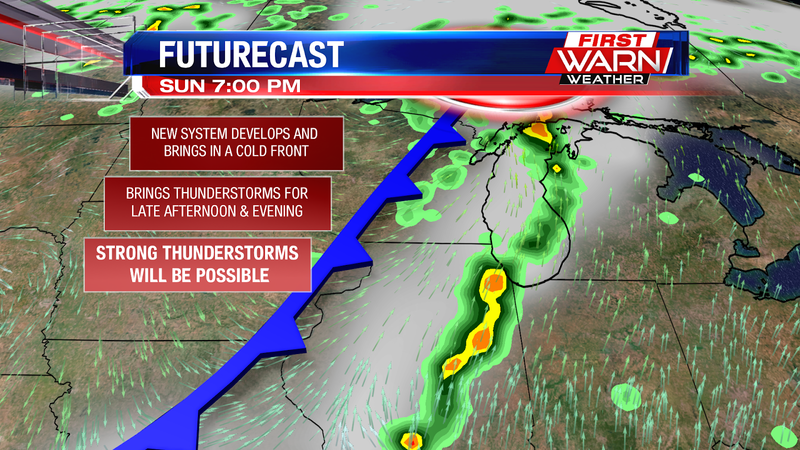 By Thursday night a warm front will lift northeast through northern Illinois and southern Wisconsin. 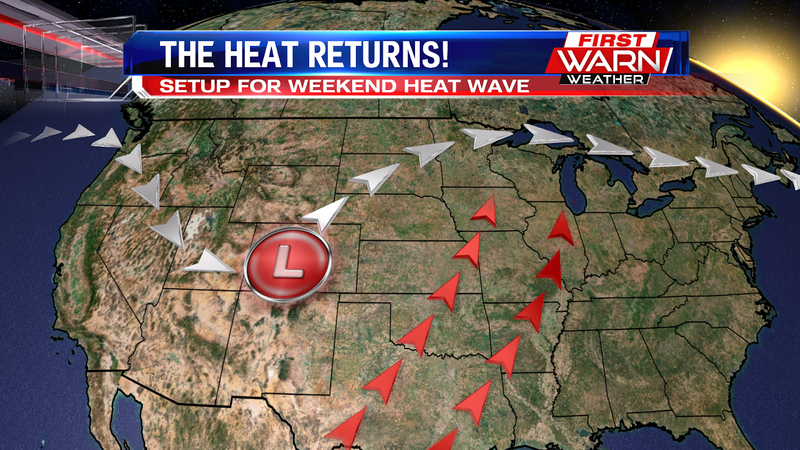 This will bring a chance for thunderstorms Friday morning, with heat returning for the upcoming weekend. 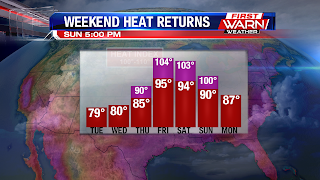 rise into the 90's, but with the dew point temperature expected to warm into the 70's, the heat index could rise over 100 degrees for the last weekend of June. Thankfully we got a break from the rain this weekend, and the dry weather will stick around today too, but the storm threat increases by sunrise Tuesday. 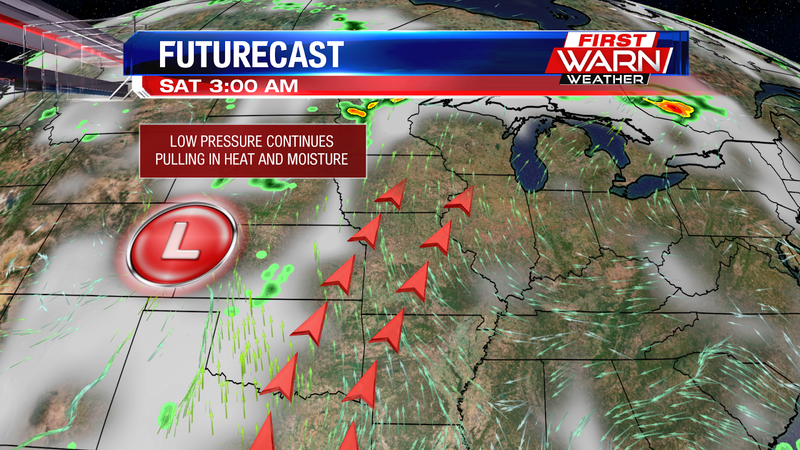 A strong low pressure system will move out of the plains today and move into Iowa. 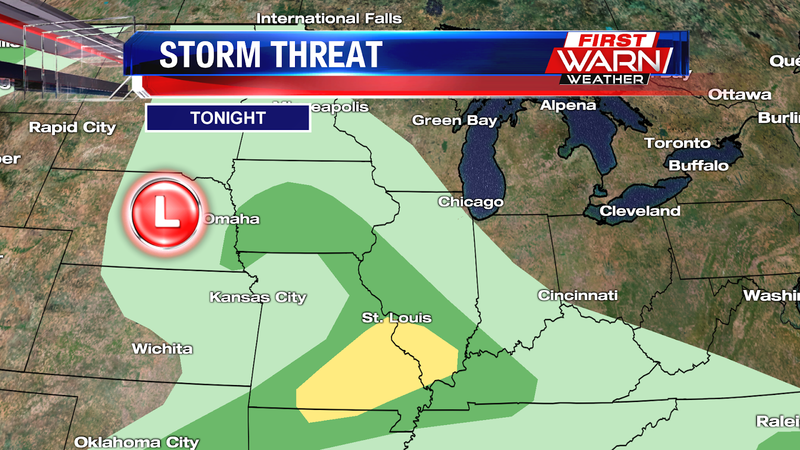 Storms will develop and move into Iowa this afternoon. Showers and storms remain to our west today, but we will see some of the cloud cover from these storms this afternoon. Dew point numbers will be on the increase tonight and tomorrow, into the low 60's, as moisture begins to move northward. A warm front will be to our west today and tonight, but will be brought northward through the area, due to low pressure moving into Iowa. As warm air moves over the warm front, instability will begin to grow. 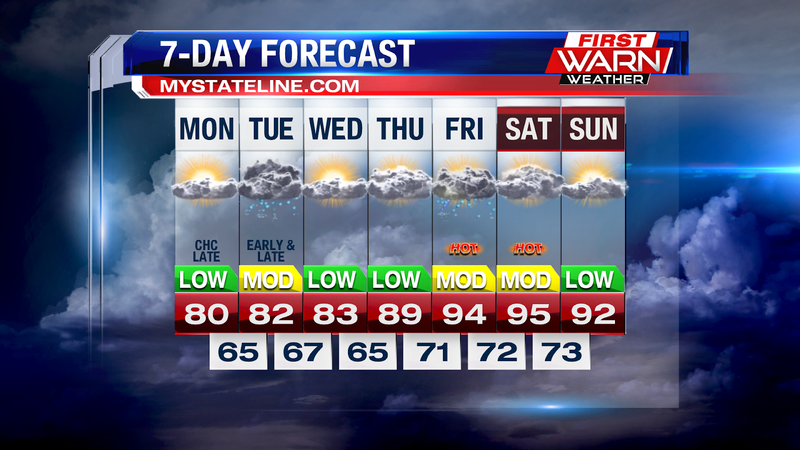 The first chance for rain arrives Tuesday morning around daybreak, with energy arriving ahead of the low. This round doesn't have much of a severe weather threat, but could produce heavy rain. Showers and thunder could linger into the late morning, with a midday break from rain possible. What happens with the storms tomorrow morning though will have an impact on what happens in the afternoon. Depending on the coverage of rain and storms tomorrow morning and how long they last, it could limit the severe threat in the evening. Right now there will still be enough instability to hold onto the strong storm threat, as storms develop in Iowa tomorrow midday and track east into Illinois. 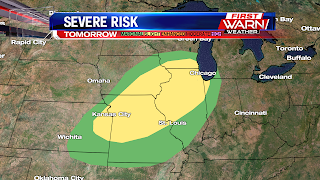 Right now there is a slight risk for severe storms in place for northern Illinois and southern Wisconsin, along with central Illinois, portions of Missouri, and southeast Iowa. 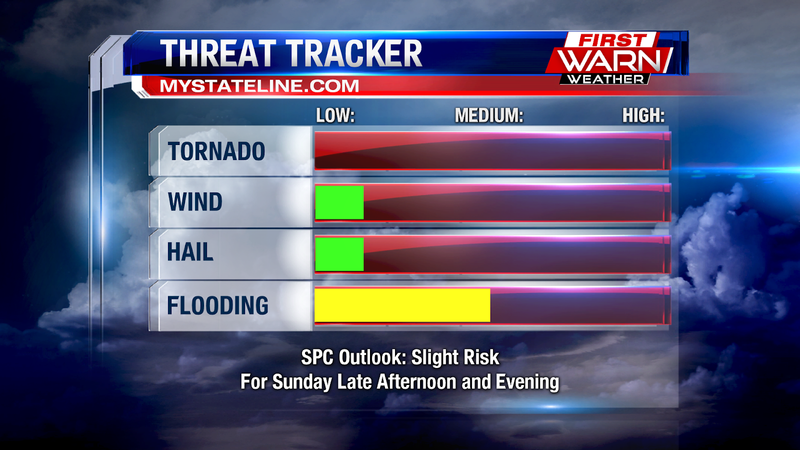 If the severe threat holds, the storms could produce hail, gusty winds, and heavy rain. Right now the timing is forecast around 4pm through the evening, with the threat diminishing overnight. If the low pressure track moves south, then the severe threat could shift south too. 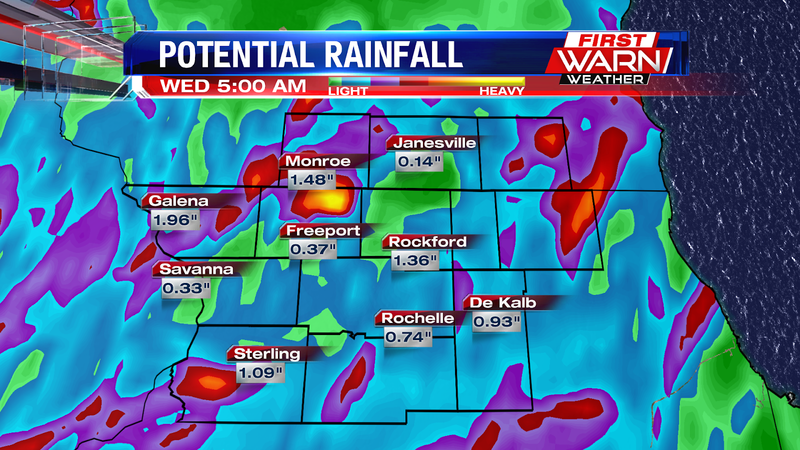 However, we want to watch the potential for heavy rain too, with rain totals near .50-1.50" possible. Make sure to check back for more updates on storm potential! 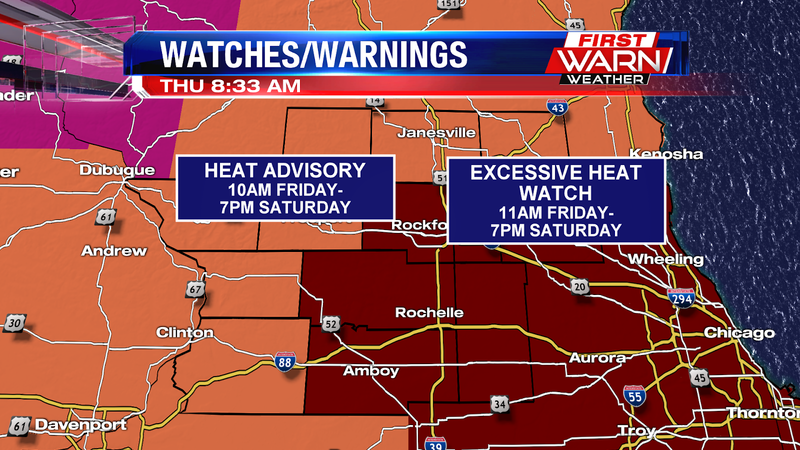 The Stateline has had its' fair share of extreme weather already this summer, both from temperatures and precipitation. So far this month, we've received 12.03 inches of rain, when 3.81 inches is normal! We've also had bouts of warm temperatures a couple of times! On May 27 we hit 97 degrees and followed that up with 92 on May 28 and 29. Then on June 16-18 we hit the 90's again for a 3 day span. Now it looks like we are headed there again as a strong ridge is heading our way from the west. 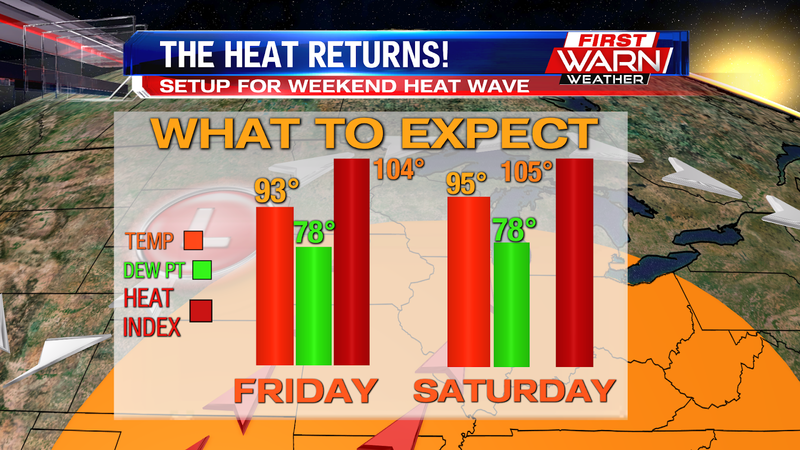 Current models are indicating we will be very warm from Friday thru Sunday with temperatures in the low to mid-90's. Normally we experience 15 days per year with temperatures in the 90's or greater. We are already well on our way! It's been a while since we've seen a beautiful view like this one! We finally got some dry time, seeing partly cloudy skies and cooler temperatures to start the weekend. 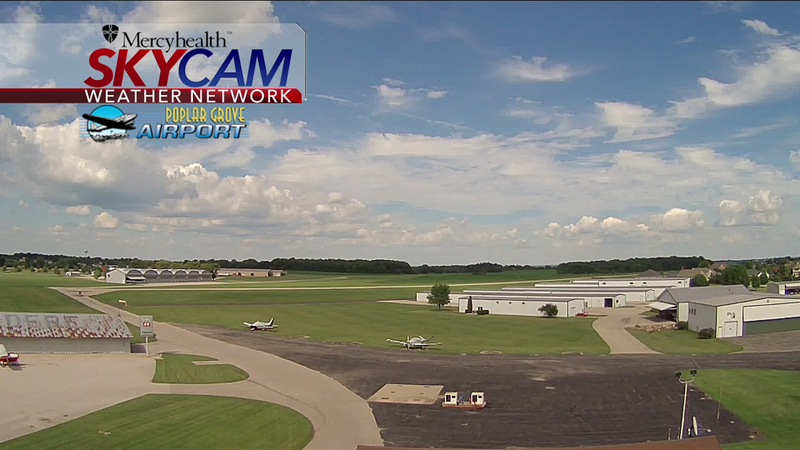 We keep these nice conditions for the evening, with temperatures in the low 70's. However, there is a small disturbance out west that's moving towards us. This disturbance is associated with a mid-level shortwave trough that's pushing eastward. 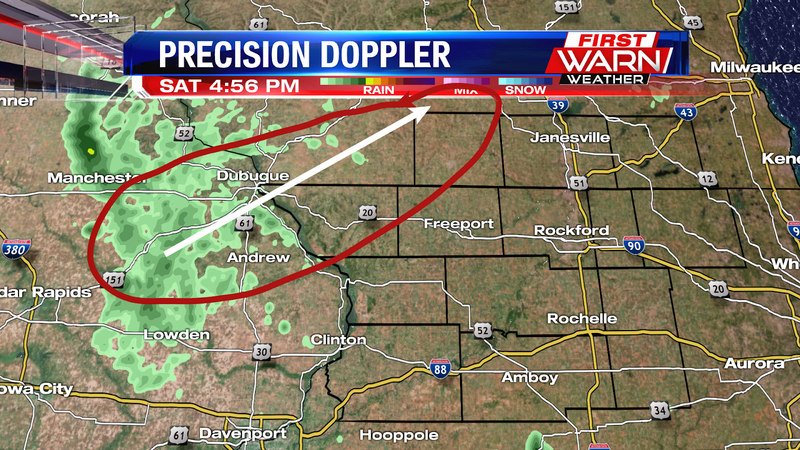 This has developed some light rain showers over in Iowa. However, this system won't have a big impact on our area, only skimming the northwestern portion of the Stateline. 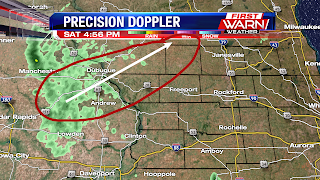 Jo Daviess, northwestern Carroll, and southern Wisconsin will get some quick rain showers this evening, but otherwise we stay dry. Even though we're seeing a dry pattern this weekend, there are still a couple spots to be cautious of as flooding still remains. 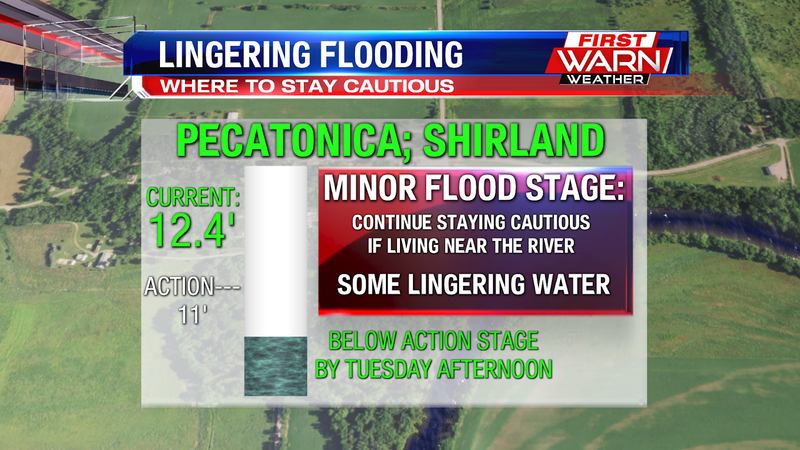 These two areas are the Rock River in Byron, and the Pecatonica River in Shirland. Both of these areas are still at Minor Flood Stage levels, so continue to be cautious if living near the river in these areas. 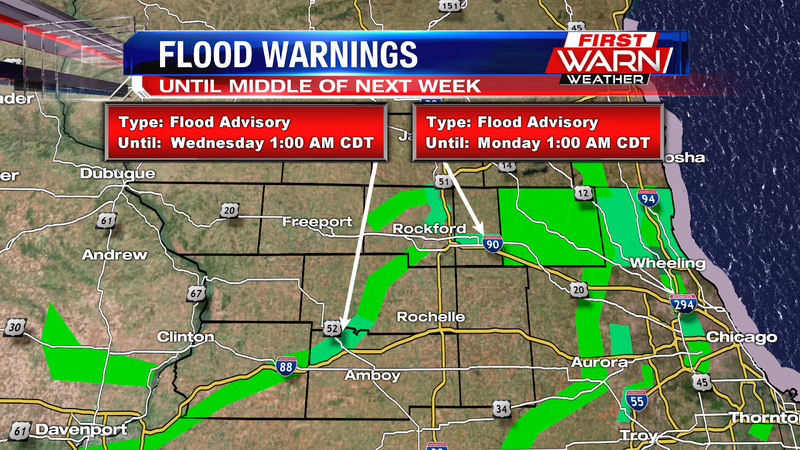 It will take some time before these areas get to see water levels below action stages. 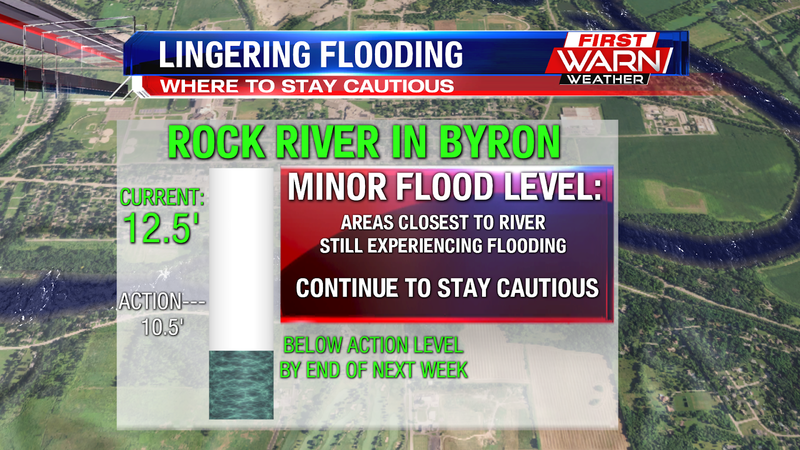 The Rock River is not expected to see water levels below Action Stage until the end of next week. It's currently at 12.5 feet, with the action stage being 10.5 feet. 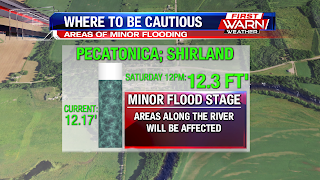 As for the Pecatonica River out in Shirland, those river levels are currently at 12.4 feet, with their action stage being 11 feet. By Tuesday afternoon, the water levels in this area should be back to normal, but continue to stay cautious until then as it'll be a slow decrease in water levels. Another thing to keep in mind are the storm and rain chances that we have coming next week. Chances for rain are coming up Monday night, Tuesday, and Thursday. There is a chance that this could delay the time it takes for these two areas to see regular water levels again. The biggest delay would be for Byron, as it's already going to take until the end of next week without including the extra rain, but still stay aware of this if living in Shirland. Along with those storm chances next week, temperatures will be warming up quite a bit! In fact, by the end of next week, we could be dealing with another heat wave as temperatures could climb into the 90's again. 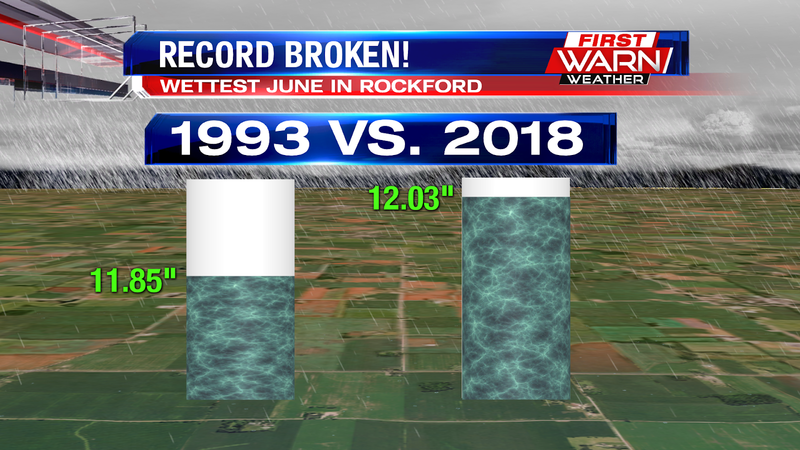 After all the rain we've had this week and today, we've officially broken the record for the wettest June in Rockford. So far this month we've had just over a foot of rain! 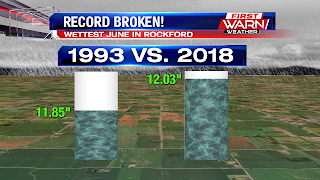 The last record was set in 1993 with a total of 11.85" of rain in the Rockford area. We've still got some rain moving through this evening, but much needed dry time is in store for us....and at the perfect time too! 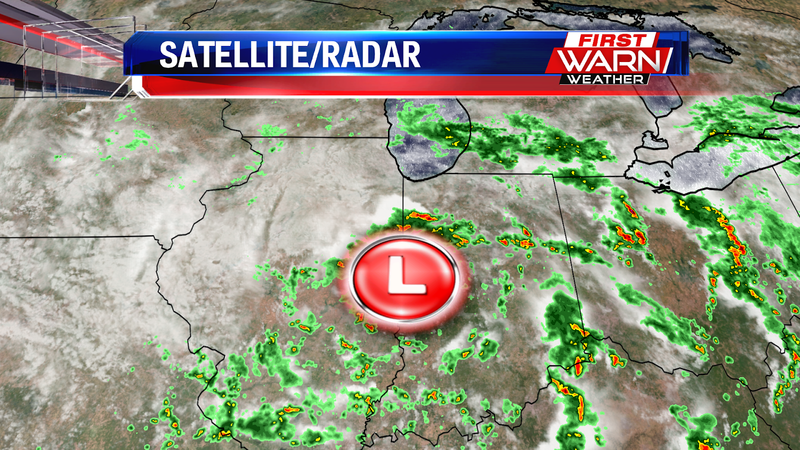 This stacked low moving through Indiana is what's been bringing us these rain showers. The fact that it's stacked is why these showers have actually been pushing westward today, as opposed to the usual eastward motion. We'll continue seeing isolated showers for the evening, but most of us should be dry by around 10pm....and then we stay that way for the overnight and the weekend! Temperatures will hit the upper 70's for Saturday under partly cloudy skies, with lower humidity as well. Sunday will be a little warmer in the mid 80's under partly cloudy skies, but it'll be a little more humid. Even though dry time is around the corner, we've still got some areas we need to pay attention too. 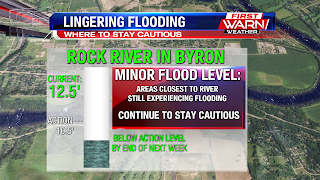 Flood Warnings are still in play for the Rock River in Byron and the Pecatonica River in Shirland, both areas seeing water levels still slowly rising. The Rock River will be cresting at 13 feet during the overnight at around 2am. 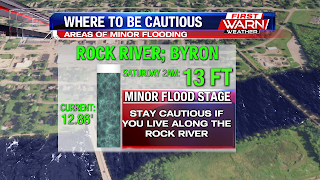 This means the Rock River will be at its Minor Flood Stage level in this area, and many areas along the river are already under water, so continue to be cautious if you live along the Rock River. 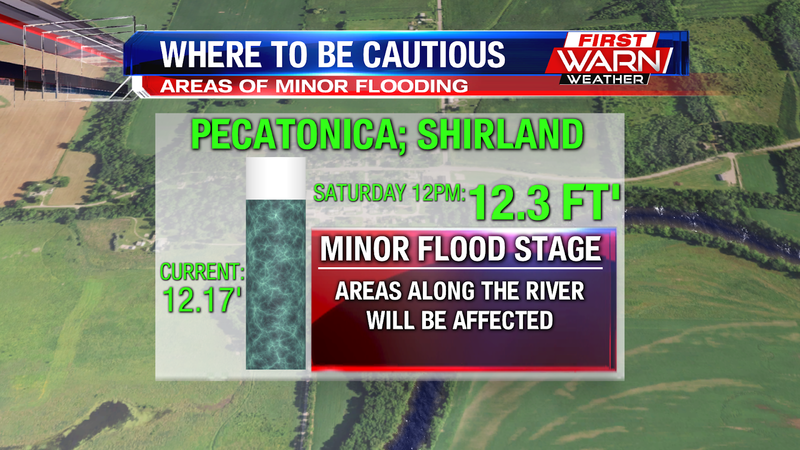 The Pecatonica River will be cresting at just over a foot by mid-day Saturday. 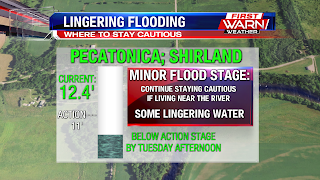 This area will also be seeing its Minor Flood Stage levels, so take precaution if you live in Shirland, especially if you live close to the Pecatonica River. Both of these areas won't see water levels below flood stage until the middle of next week, so even though we stay dry this weekend, continue to stay cautious if living in these areas. Rain chances do return once we get back into the work week, with storm chances on Monday and Tuesday. Temperatures will also gradually warm up going through next week as well, possibly hitting the upper 80's by the end of the week. 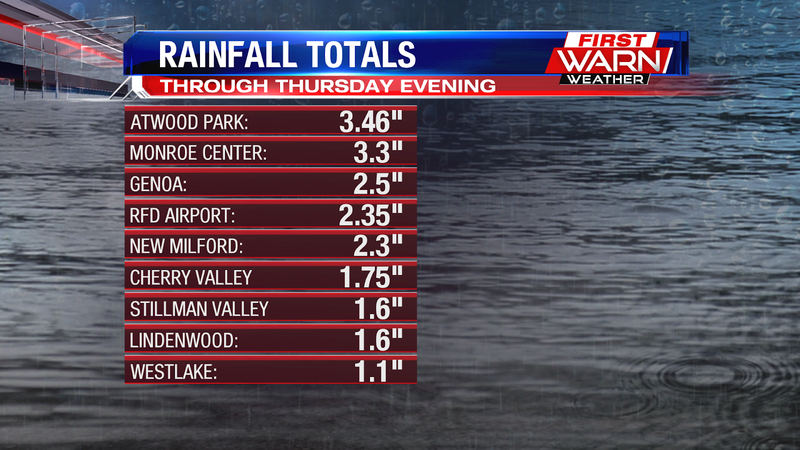 As you read in the last post, Thursday was a record breaking rainfall day for Rockford. With several days this week with heavy rain, our monthly rainfall total is getting closer and closer to that twelve inch mark. With recent rains causing saturated ground soil, the additional rain we received was forced to run off and move into already swollen rivers. This has lead many of our local rivers to rise, with many entering a flood stage. 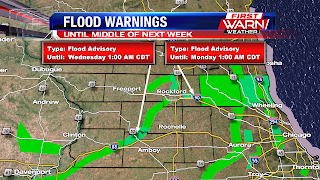 Most will stay at either action stage or minor flooding, however there are points on both the Rock River, and Kishwaukee River that will crest this weekend at moderate flood stage. Saturday the Rock at Byron is forecast to crest at 14.2 feet, which is at moderate flood stage. The Kishwaukee at Belvidere is also forecast to be at moderate flood stage by Saturday, cresting at 10.6 feet. 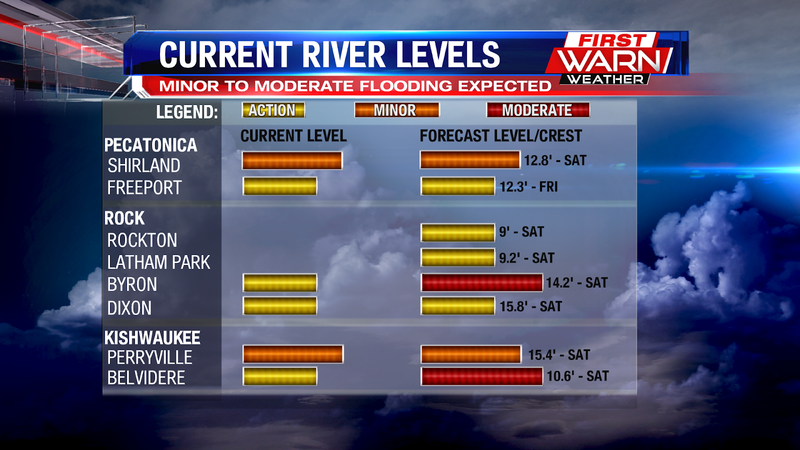 River waters will start to recede and go down early next week. If you plan to go out on local rivers this weekend use caution and pay attention to river levels. Heavy rain came down Thursday morning and afternoon over much of northern Illinois with anywhere from 1-3 inches recorded. 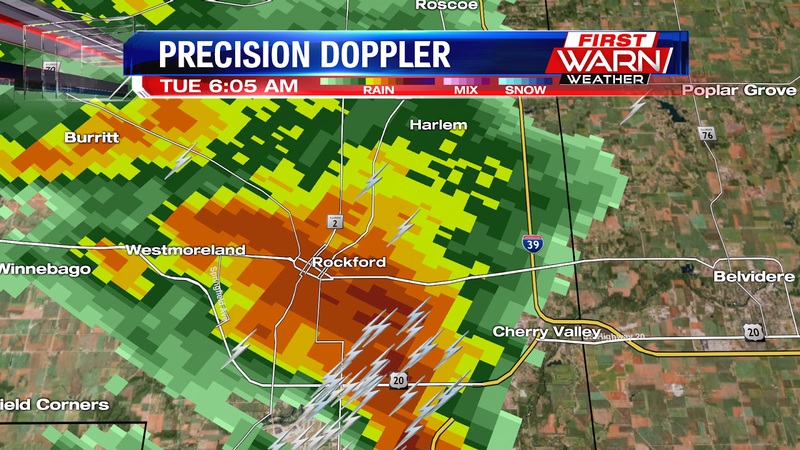 In Rockford, a total of 2.35 inches of rain fell, with more to come during the overnight. 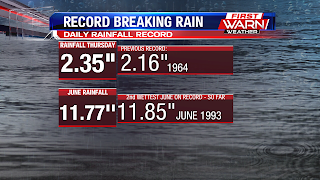 That total breaks our daily rainfall record for the 20th of June. The previous daily rainfall record was 2.16 inches set back in 1964. 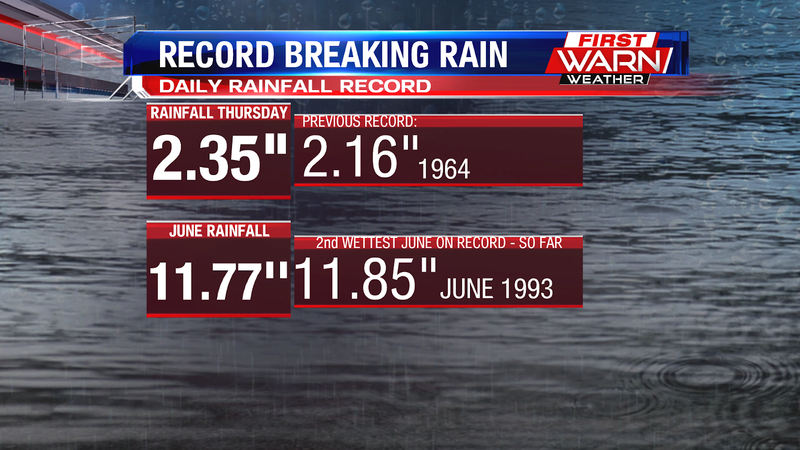 Not only that, but we are very close to breaking the record for the wettest June on record. So far for the month a total of 11.77 inches has fallen. The record in 11.85 inches set back in 1993. 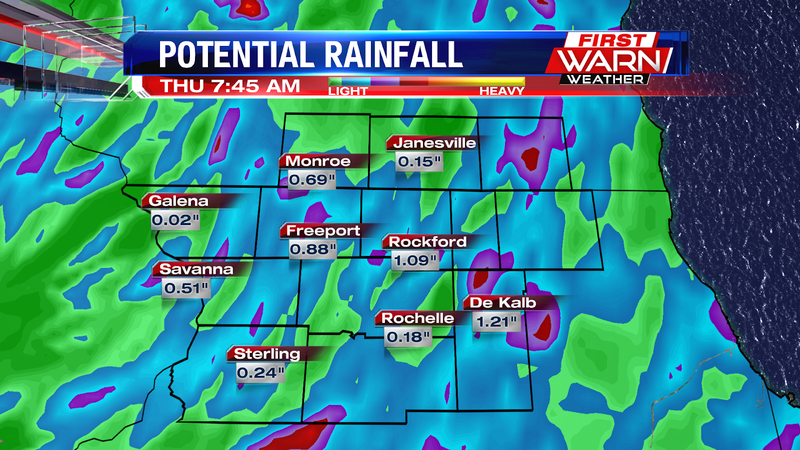 Heavier rainfall is expected to develop during the overnight, but those heavy rain bands may be focused a little to the south of Rockford. 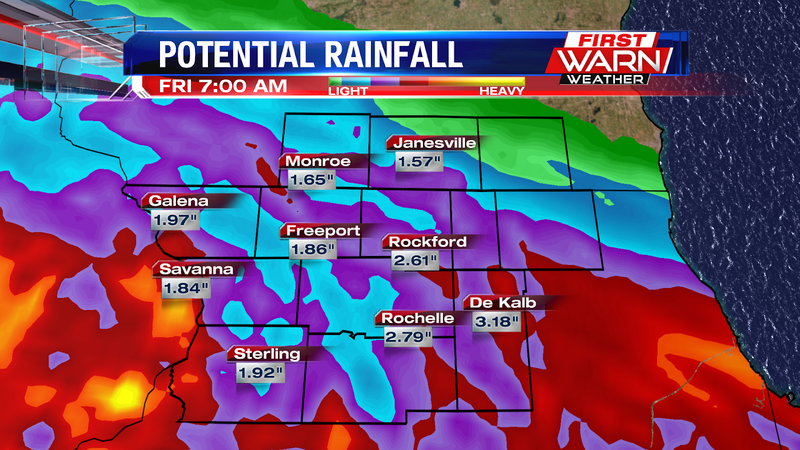 Another 1-2 inches of rain will be possible for some through Friday afternoon. 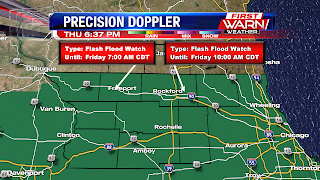 The Flash Flood Watch has been extended for Winnebago, Boone, McHenry, Ogle, Lee and DeKalb counties until 10am Friday and through 7am for Stephenson, Jo Daviess, Carroll and Whiteside counties. The watch was cancelled for southern Wisconsin. 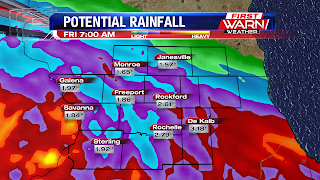 Rainfall totals over north-central and northeast Illinois range anywhere from 1-3 inches, with an additional 1-2 inches possible through Friday morning. 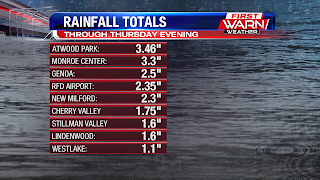 Most of the heavy rain through Thursday afternoon occurred over Winnebago, Boone, McHenry, Ogle and DeKalb counties. While Rockford has had a little bit of a break in some of the heavier rainfall, a band of light to moderate rain arcs from northwest Illinois into DeKalb County. 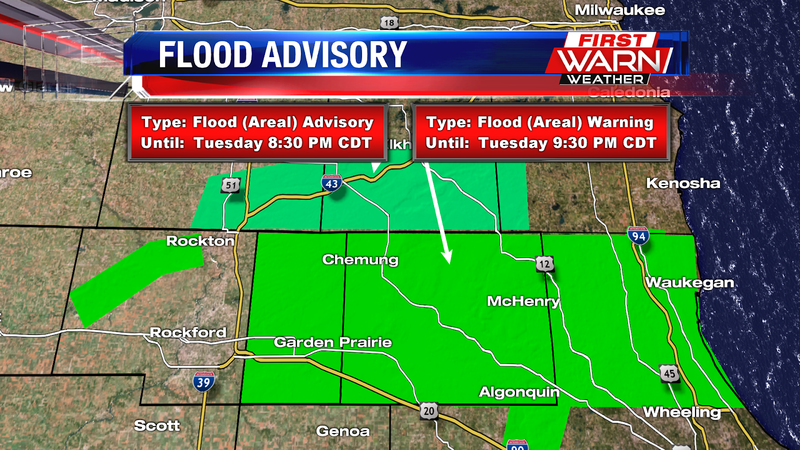 A Flood Advisory has now been issued for Ogle, Lee and southern DeKalb counties until 9:15pm. Urban and small stream flooding is possible in the advisory area, as well as with other creeks and streams throughout the Stateline. 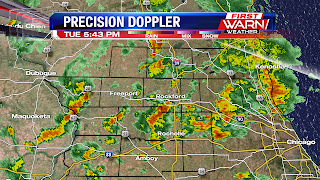 (9:27:26 PM) nwsbot: Local Storm Report by NWS LOT: 5 S Rockford [Winnebago Co, IL] cocorahs reports HEAVY RAIN of M3.46 INCH at 06:30 PM CDT -- rainfall since approximately 8 am thursday. (9:22:53 PM) nwsbot: Local Storm Report by NWS LOT: 5 S Winnebago [Ogle Co, IL] cocorahs reports HEAVY RAIN of M3.46 INCH at 06:30 PM CDT -- rainfall since approximately 8 am thursday. (7:19:10 PM) nwsbot: Local Storm Report by NWS LOT: Somonauk [De Kalb Co, IL] trained spotter reports HEAVY RAIN of M2.40 INCH at 07:05 PM CDT -- rainfall for today. 2.10 inches between 605 and 705 pm. (6:17:31 PM) nwsbot: Local Storm Report by NWS LOT: 4 SSE Loves Park [Winnebago Co, IL] trained spotter reports HEAVY RAIN of M1.30 INCH at 06:13 PM CDT -- since this morning. tulip and travertine. (6:01:47 PM) nwsbot: Local Storm Report by NWS LOT: 2 S Winnebago [Winnebago Co, IL] broadcast media reports HEAVY RAIN of M1.03 INCH at 03:30 PM CDT -- wtvo studios. 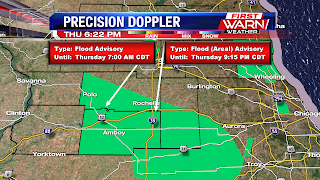 (5:57:00 PM) nwsbot: Local Storm Report by NWS LOT: Roscoe [Winnebago Co, IL] broadcast media reports HEAVY RAIN of M1.25 INCH at 03:30 PM CDT -- relayed by wtvo Rockford. (5:56:21 PM) nwsbot: Local Storm Report by NWS LOT: Stillman Valley [Ogle Co, IL] broadcast media reports HEAVY RAIN of M1.60 INCH at 03:30 PM CDT -- relayed by wtvo Rockford. (5:55:35 PM) nwsbot: Local Storm Report by NWS LOT: Cherry Valley [Winnebago Co, IL] broadcast media reports HEAVY RAIN of M1.03 INCH at 03:30 PM CDT -- relayed by wtvo Rockford. 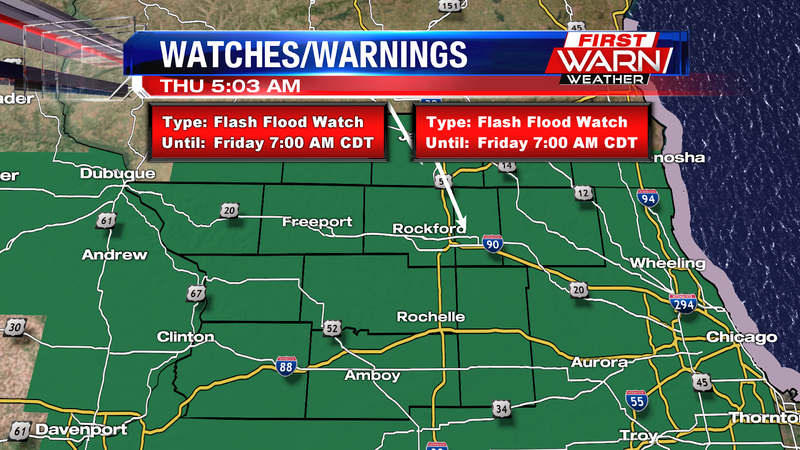 A Flash Flood Watch has been issued for northern Illinois and southern Wisconsin until 7am Friday morning. So far, light to steady rain has been lifting north, rotating around the low pressure system to our southwest. At times today, rain will turn more moderate to heavy with embedded thunderstorms also possible. Rain will move over areas that are already saturated from the heavy rain earlier this week, and rivers are already swollen. So, any additional rain will run off and into already high rivers. Make sure to stay weather aware today and tonight with rain totals still forecast between 1-2", with localized areas potentially getting 3-4". The break from the rain Wednesday afternoon was short-lived as light to moderate rain moved back into northern Illinois and southern Wisconsin. Scattered showers continue to move through west-central Illinois and will move in our direction throughout the night. Rainfall Wednesday night into early Thursday will remain light and under half an inch, but heavier rainfall is possible throughout the day Thursday and Friday. 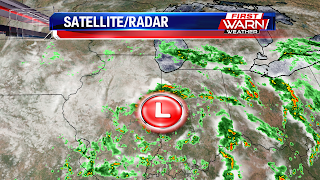 Low pressure moving into northwest Iowa will shift south of the Stateline, moving through central Illinois Thursday afternoon. Several upper level disturbances will rotate around the low, moving into northern Illinois Thursday morning and afternoon. Moisture levels in the atmosphere remain fairly high and this could lead to periods of heavy rainfall through Friday morning. 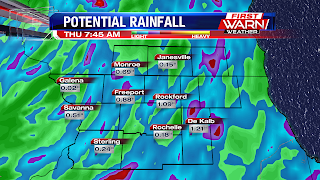 Rainfall totals could very well end up ranging from one to three inches between Wednesday night and Friday night. 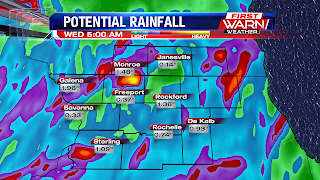 While not as significant as the heavy rain that came down Monday evening, any additional rainfall will fall on already saturated ground and this could lead to flooding in some locations. 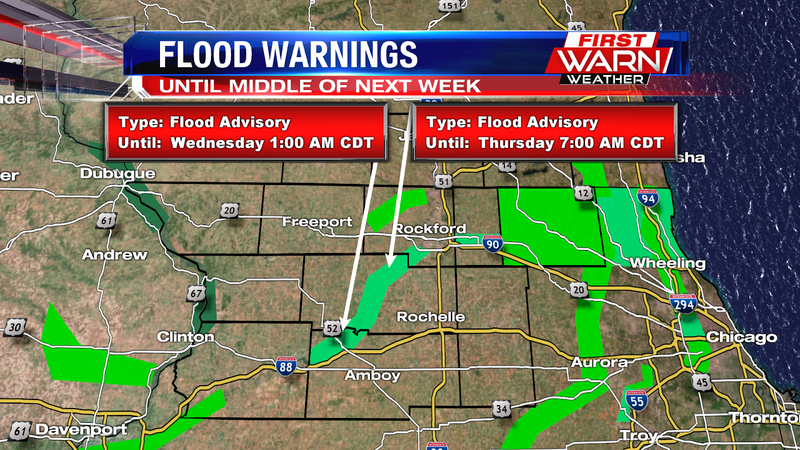 Another concern will be the potential for minor flooding along some of the local rivers and creeks. 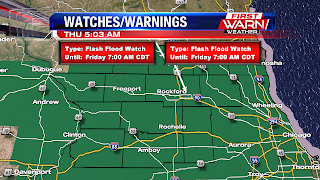 Right now the Pecatonica River at Shirland, the Rock River at Byron and Kishwaukee River at Perryville are under a Flood Warning with the Pecatonica River at Freeport now under a Flood Watch and the Rock River near Rockford and Dixon under a Flood Advisory. 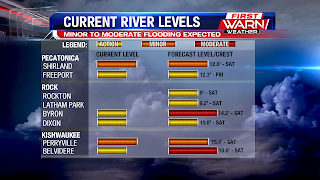 If the forecast amount of rain does occur, river flooding may be an issue heading into the weekend.